Methuselah (Hebrew: מְתֿוּשֶלַח / מְתֿוּשָלַח, Modern Mətušélaḥ / Mətušálaḥ Tiberian Məṯûšélaḥ / Məṯûšālaḥ ; "Man of the dart/spear", or alternatively "his death shall bring judgment") is the man in the Hebrew Bible reported to have lived the longest. Extra-biblical tradition maintains that he died on the 11th of Cheshvan of the year 1656 (Anno Mundi, after Creation), at the age of 969, seven days before the beginning of the Great Flood. Methuselah was the son of Enoch and the grandfather of Noah. Methuselah is mentioned in one passage in the Hebrew Bible, Genesis 5:21–27, as part of the genealogy linking Adam to Noah. The genealogy is repeated, without the chronology, at 1Chronicles 1:3, and at Luke 3:37. The following is taken from the King James Version of the Bible. Masoretic 187 782 969 Methuselah died in 1656 AM, the year of the Flood at the age of 969. The Sumerian king list mentions a character named Ubara-Tutu who seems almost identical to Methuselah. He was the son of En-men-dur-ana the Sumerian Enoch, and king of Sumer until the flood swept over the land. Although their ages are different their father and year of death remain the same. Bartolomé Bermejo, Christ Leading the Patriarchs to Paradise, c. 1480. 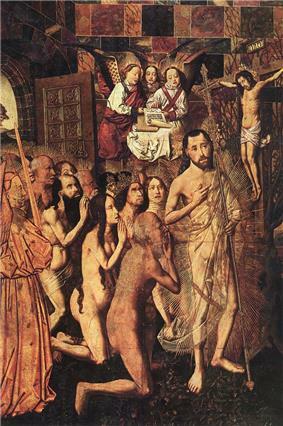 In this depiction of the Harrowing of Hell, Methuselah is portrayed as leading the procession of the righteous behind Christ, along with Solomon, the Queen of Sheba, Adam and Eve. The meaning of Methuselah's age has engendered considerable speculation, but no widely accepted conclusions. These speculations can be discussed under four categories and their combinations: literal, mistranslation, symbolic, and fictional interpretations. Literal interpretations of the Bible take Methuselah's 969 years to be 969 solar years. Some literalists suggest certain pseudoscientific arguments for how this could be: early humans had a better diet, or a water vapor canopy protected the earth from radiation prior to the Flood. Others introduce theological causes: humans were originally to have everlasting life, but sin was introduced into the world by Adam and Eve, its influence became greater with each generation, and God progressively shortened human life, particularly in the postdiluvian era. Some believe that Methuselah's extreme age is the result of an ancient mistranslation that converted "months" to "years", producing a more credible 969 lunar months, or 78½ years, but the same calculation applied to Enoch would have him fathering Methuselah at the age of 5 using numbers from the Masoretic Text. Donald V. Etz suggested that the Genesis 5 numbers "might for convenience have all been multiples of 5 or 10". If the Septuagint numbers are divided by 10, Enoch's 165 when he fathered his son would be 16½ years, and Methuselah's 969 when he died would be 96.9 years. Methuselah's father Enoch, who does not die but is taken by God, is the seventh patriarch, and Methuselah, the eighth, dies in the year of the Flood, which ends the ten-generational sequence from Adam to Noah, in whose time the world is destroyed. Among those who believe that all the numbers of Genesis 5, including Methuselah's age, have no meaning at all, Kenneth Kitchen calls them "pure myth", Yigal Levin believes they are intended simply to speed the reader from Adam to Noah, and Claus Westermann believes they are intended to create the impression of a distant past. The word "Methuselarity" was coined by Aubrey de Grey to mean a future point in time when all of the medical conditions that cause human death would be eliminated and death would occur only by accident or homicide. The term "Methuselah" is used extensively in modern times and in popular culture. See Methuselah (disambiguation). ^ Methuselah dying before the flood is based on the Masoretic Text of Genesis 5 and his dying after the flood based on the Genesis 5 numbers in the Lucianic Septuagint (Codex Vaticanus). ^ Hasel, Gerhard F. (1980). "Genesis 5 and 11: Chronolgenealogies in the Biblical History of Beginnings". Origins 7 (1): 23–37. ^ "The Book of Enoch". Retrieved 2006-08-29. ^ Pilch, John J. (1999). The Cultural Dictionary of the Bible. Liturgical Press. pp. 144–146. ^ Hill, Carol A. (December 2003). "Making Sense of the Numbers of Genesis". Perspectives on Science and Christian Faith 55 (4): 239–51. ^ Etz, Donald V. (April 1993). "The Numbers of Genesis V 3-31: A Suggested Conversion and Its Implications". Vetus Testamentum 43 (2): 171–89. ^ Bennet, Ellen H. (1897). "Cosmogony, or Creation of the World". Astrology: Science of Knowledge and Reason: A Treatise on the Heavenly Bodies in an Easy and Comprehensive Form. New York. pp. 30–7. ^ Levin, Yigal (October 2001). "Understanding Biblical Genealogies". Currents in Research: Biblical Studies 9: 11–46. ^ de Grey, Aubrey. The singularity and the Methuselarity: similarities and differences (see PDF link) 2009, 149, pages 195–202. McKague, Lee (1999). "Methuselah: Oldest Myth, or Oldest Man?". Journal of Scientific Exploration 13 (3): 483–97.